I work predominantly in sports nutrition and I basically became interested in it just from my own personal interest in sport. I did a lot of sport when I was younger and was just interested in the link between what you ate and how that affected performance. I used to experiment with my own diet and was enthusiastic about learning more. When I was in early high school, probably Year 8 or Year 9, I decided I wanted to work as a sports dietitian. I headed down that path, did a human movement degree at Deakin, and then did dietetics after that and got into nutrition from there. I was unemployed for a little while after I finished my dietetics degree. I feel that these days, with sport even more so I think, there are a lot of people interested in that area so it’s more competitive. With fewer roles for the number of dietitians, it can be quite frustrating at the start, but I guess one of the things that I’ve talked a lot about to students is trying to create your own opportunities. A lot of the work in nutrition isn’t advertised as a position on a website, it’s often talking to people and about who you know, not just what you know. I’ve worked for nearly 20 years now in nutrition. I’ve worked in lots of different environments over the time, but now I’ve got two little boys so I’m working more part-time and doing consulting and private practice. I’m fortunate enough to still work with a sporting team—I currently work with Melbourne United Basketball. Over the years, I’ve been quite involved with Sports Dietitians Australia as well because I feel quite strongly about the role of nutrition in sport and promoting the role of dietitians as the providers of nutrition in sport too. I’ve tried to get involved a bit with the organisation and have been on the board and was president for a couple of years, really because I just wanted to help our profession where I could. What was your first role as a sports dietitian? When I first graduated, I was unemployed for six months. However, because I had the human movement degree, I could work as a gym instructor and personal trainer. I started working at a gym in Hawthorn and they had an office there at the gym, and I just asked them if I could start seeing a few of the gym clients to talk to them about their nutrition. It started up just as a little private practice there seeing members of the gym and then it expanded to other people. I did some promotion with GPs beyond the gym as well, and built from there. From going to Sports Dietitians Australia meetings and meeting other dietitians, the opportunities I was seeking came up. I also did a lot of volunteering with sports clubs also to get some experience. 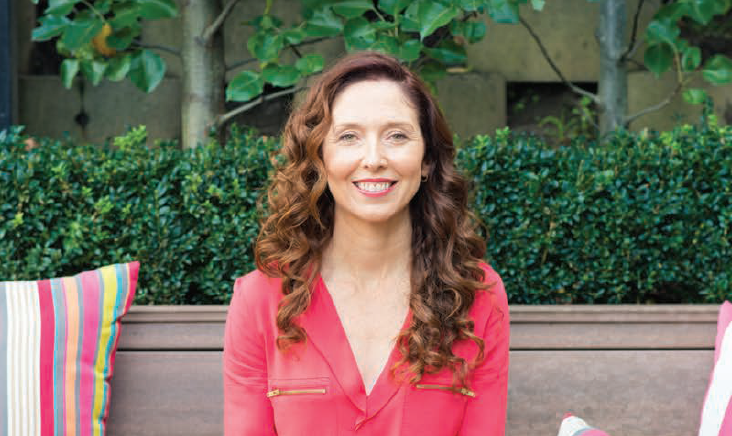 I built up my private practice from there, so I’m a little bit different to some dietitians who come out and work full-time and have a permanent job when they first graduate. I had a few interviews, but didn’t get any jobs, so I built it up myself instead. What things do you focus on when you’re working with athletes at Melbourne United? There’s a few different elements to my role and I’m fortunate that I will be in at the club at least once a week. The squad is only around 15 players, so it’s good to be there regularly and see them individually. We try to really individualise it to their needs. Some of the athletes will have goals where they’re trying to increase their muscle mass, then you get others who tend to put on weight quite easily and are trying to reduce their body fat level. We look at their body composition— part of my role is to monitor this. We try to focus a bit more so it’s not all about body composition; we try to focus on their nutrition before games, before training and during recovery. We also look at their immune system because they have a busy schedule—they might have two games a week compared to other sports, which might only have one, plus they travel a lot with NBL teams spread right across Australia. We focus on injuries too, so when athletes get injured we look at what they need to do with their nutrition rather than their nutrition going out the window during that time. Also, I get to be involved in catering because they travel quite a lot to games. I will liaise with the hotels about the venues or help to source restaurants where they can eat and I always check or have input to the menus of wherever they’re eating. It’s also part of my role to monitor and advise on any supplements – NBL players are subject to code compliance, so we do need to make sure anything they take is low risk. That’s an important part of my role as well. I’m involved with the hydration too—hydration monitoring and looking at their fluid losses and fluid intake during games, just to give the players feedback on how much they should be drinking and what type of fluid may be best at different stages. Do most players over-hydrate or under-hydrate? It’s a bit of a mixture. It depends on the players in the squad—you get some individual athletes who are heavy sweaters and they’ll lose a lot in games. Then you get others—especially if they’re on the bench for a lot of the game and not getting much game time—they can sit there with their drink bottle getting a bit nervous and they keep sipping, they can overdrink as well. There are issues with both aspects, so we try to individualise it so we can provide specific feedback for each player on what they need to do. You mentioned focusing on the immune system. What kind of stuff do you do to boost their immune system when they’re playing twice a week? I look at their overall nutrition and whether they’re getting adequate energy for what they’re doing, and the timing of their intake as well to make sure that they’re eating at the right times—that they’re going to have energy for their training and aren’t getting run down. You can look at their vitamin and mineral intake as well because I would say, especially with basketball and if the players are living on their own, sometimes their fruit and vegetable intake is quite low. That’s something I focus on with all clients, increasing vegetable intake! When players get injured, what kind of changes are there with their nutritional requirements? It depends on the type of injury an athlete sustains and the length they’re going to be out for, but there’s a whole range of things you focus on. One of them is making sure that they’re not losing too much muscle mass. You want to make sure that they’re not cutting down their energy intake too low, but then you don’t want them to be having too high an intake when they’re not training and then putting on a lot of body fat during that time. We look at adequacy of protein intake, so making sure they’re still eating enough protein to help preserve the muscle mass. There are some particular strategies that can be used in terms of supplements for particular injuries. There’s currently a lot of interest in nutrition supplements for injury, like gelatin, Vitamin C, creatine, HMB and green tea…the specific approach will depend on the individual athlete and type of athlete. It’s become quite specific as often people in the past when they were injured said, “Oh well, I’m not training so I don’t have to worry about my diet,” or all they were worried about was just not putting on too much weight—they didn’t look more specifically at their nutrient intake. Monitoring protein is really important and making sure athletes are having protein regularly – in all their meals and snacks—to help preserve muscle mass. You’ve been working in sports nutrition so long—have there been any major changes you’ve noticed over the years? I guess there have been changes that are similar to changes in the wider population in that there’s more interest in different styles of eating, such as vegetarian/vegan approach, Paleo and low-carb high-fat (LCHF). Athletes often jump onto nutrition trends as they’re always looking for a way they can improve their performance. Sometimes they jump onto things that aren’t necessarily athlete-appropriate. Also, the science has changed a little bit in terms of how we look at fats and carbohydrates. There’s been a move away from the really high carbohydrate diet. When I first graduated, it was very much all about carbohydrates and how much athletes needed, and there was less focus on the more balanced intake and getting those good fats in. The interest in supplements has also increased. There are so many supplements now that are available to athletes, but also the scrutiny of these supplements has increased too. Professional and elite athletes will be tested regularly for use of banned substances. Looking for that performance edge in non-legal ways has always been around, but over the years it’s been more highlighted and there’s more awareness around it. Do you anything specifically with diet to reduce the build-up of inflammation? Yes, and that’s something that comes with injury nutrition recommendations as well. There’s not a lot of good research specific to athletes so that can be an issue. A lot of it is translating from other areas, so often things like fish oil and omega-3s are recommended based on research into joints for people with arthritis. Certainly looking at the balance of fats and what types of fats you’re taking in and the effect they have on inflammation is important. Do you consider the glycaemic index important for athletes? That’s probably one of the changes that has occurred over the years. There was a push around low GI and you had to have low GI before exercise to keep your energy levels stable to train and perform, but now there’s probably less of a focus on that and it’s more around what athletes can eat before they train that’s going to give them some fuel and energy that sits well with them—it’s not just low GI food. Low GI in general is often a more nutritious way of eating because often the lower GI foods have more nutrients and more fibre and better manage blood glucose levels. But sometimes, the really low GI foods for an athlete before they’re about to compete—like wholegrain breads and legumes—don’t sit very well before athletes are about to run around, in terms of gut symptoms. That’s where sports dietitians help athletes to work out what the best pre-sport combinations are for their fueling, but also to manage their gut comfort as well. Do you or the teams you work for ever enforce rules regarding nutrition? I have one rule: no lollies. That’s about it. A lot of the teams I have worked with in the past, the half-time lollies or post-match lollies were out of control—even at junior sporting events, there are often lollies everywhere. I went to the dentist last week and he said that half of all six-year-olds have had fillings! I just found that ridiculous. No wonder, when you go to junior sports and there’s lollies around—that’s the worst time to have lollies after you’ve exercised because saliva production decreases and your teeth are more vulnerable to sugar at that time. That’s another change that’s probably happened over time as well: there’s been less focus on the sports drinks and simple sugar carbohydrate supplementing for sport and there’s been more focus on the natural sources. The lolly thing is the one thing I say no to, but otherwise it’s more working with the individual athletes and what they need more than anything. I tend to not love team rules because there’s so many different individual needs within a sport. Just thinking about students and more recently graduated dietitians who are interested in getting involved in sports nutrition, when I graduated there was probably a similar amount of work, but there were less people interested in it I think. In fact, there is probably more work around now. But it’s trying to just get experience and talking to other dietitians and doing some volunteering—not that you want to be working for free for too long, but just to get some experience. And get involved with Sports Dietitians Australia and get to their meetings, you might be able to meet other Dietitians, who can be great sources of new opportunities. It’s also important to understand that when working in sport, there’s lots of good thing about it, but there’s lots of challenging things as well. You certainly don’t work 9–5 hours, the majority of your hours will probably be out of hours: weekends and early mornings. Standing out on freezing cold football fields in the middle of winter—there are lots of things to consider. I guess there is a bit of job insecurity too in terms of sporting team’s contracts and frequent changes in club staffing. Dietitians only usually get a one-year contract, they don’t sign us up for five-year contracts like the coaches and players! So financially, there can be some a lack of stability. I’ve always loved working in sport, but there are lots of things that people might not be so keen on once they get involved working in that environment! Saying this, I love working in sports nutrition, with elite athletes but also with all the great individuals who want to do their best to be their best! 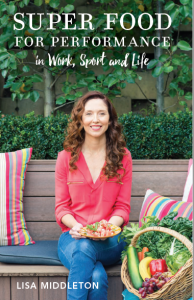 I have just finished a book ‘Super Food for Performance – in Work, Sport and Life’ that incorporates some of the things I have learnt over the years via both theory and experience. This book is designed to help people who want to get the best out of themselves in whatever you do, and how to apply the habits of elite athletes to help you perform at your best. It includes plenty of practical meal and snack ideas, to not only help you understand how nutrition can impact your health, energy levels and performance but also put it into practice!